Everyone knows I’m a walleye guy. I’m in pursuit of this marble-eyed fish almost every day, guiding clients and friends on lakes throughout Wisconsin from Winnebago to the Bay of Green Bay. Now, don’t get me wrong; I love fishing for walleye. If I didn’t, it sure would be hard to do what I do everyday, being the type of personality that gets bored easily. However, there is one particular species of fish that really gets me amped up more than I already am: Muskies. It seems hard to believe that a “can’t-sit-still” persona would choose the hunt for the so-called “fish of a thousand casts” to be one of his favorite types of fishing, but it is exactly the “hunting” part that seems to be the addiction; keeping me up nights before musky trips. (Not that I sleep much anyway.) Muskies sit right below mankind in the predatory hierarchy, grow BIG, are incredible to behold and, indeed, are extremely challenging to catch, even for the most seasoned of fishermen; all reasons illustrating why I love it so much. If it were easy to hit the water on any given day and catch five giant muskies, would the people that pursue them still be addicts of the sport? Some of you will probably say, “Heck yeah! I want things easy!” If that were the case, the mystique of this fish would be completely gone. Photos of trophy muskies would become blasé, and the sense of accomplishment after catching one would be completely diluted. It IS the challenge that MAKES musky fishing what it is. Being the chosen fish of this great state, there are many, many good musky waters in Wisconsin from north to south. Waters I guide on a regular basis, such as The Petenwell Flowage, hold many big fish as well as some of the upriver lakes of the Winnebago system. 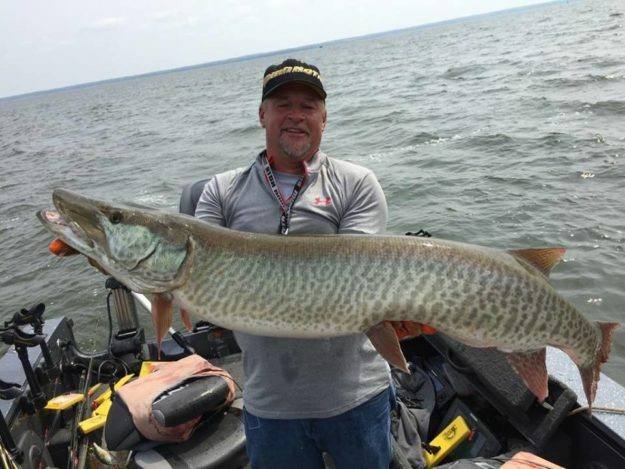 There are even rumors of some giant muskies being caught out in the vast open water areas of Lake Winnebago itself. However, there is one system that stands out like blaze orange in the November woods when it comes to truly giant fish: The Bay of Green Bay. 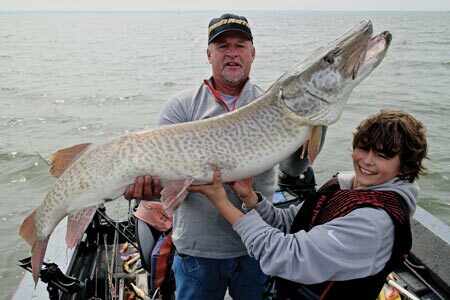 The Great Lakes strain of spotted musky, after having been reintroduced to Green Bay through stocking efforts, has thrived with many 50” fish taken every year. Much debate has taken place about whether or not Green Bay could produce a new world record. From the fish I’ve seen out of this system over the years, it sure seems possible. Green Bay muskies, being gluttons of the Bay’s abundant forage, have the massive girth to go along with their length; making them considerably heavier than their river system counterparts who deal with current and “lean-out.” It’s like the donut-eating couch potato vs. the marathon runner (not that donuts make you fat) when comparing lake fish to river fish. In this game, size matters, so bring on the donuts. Many anglers choose trolling to cover huge areas of water looking for fish. Although this is a great method, and I often troll the Bay with much success. (Evident in the giant musky caught on one of last season’s episodes of Larry Smith Outdoors.) Casting, however, and the ultimate hand-to-hand combat experience associated with the technique is how I really prefer to hunt these beasts. Traditional methods for musky casting employ 7-8’ heavy-action baitcasting outfits, spooled with heavy braid (50-100 lb. test), heavy wire leaders and, attached at the end, a variety of huge cranks, bucktails, spinners, topwaters, etc. (usually a foot or more in length.) The old adage does hold true that big baits get big fish. Many trophy muskies have been caught, and will continue to be caught on these traditional baits. However, through my career as a guide over the past 30 years, I have stumbled upon a slightly different approach to casting. Before I get into this modified casting approach, let me explain a little about finding potential holding areas for this technique. During mid to late summer, cabbage beds are key. The proverbial tiger of fresh water does like to have a jungle to live in. Cabbage beds provide shade from the summer sun in the Bay’s clear water, and also offer cover from which muskies can ambush potential prey. However, due to the lack of aforementioned “summer heat” over the past few seasons, cabbage has not as been as plentiful, which pushes a lot of fisherman to troll instead of casting to find fish. Cool summers have cabbage growing in 8-10 feet of water, coming up to within 4-5 feet of the surface. On a normal “hot” summer, cabbage will grow in as deep as 14 feet of water coming up to 6 feet from the surface or closer. More cabbage means more preferred musky habitat, along with more opportunities for a successful casting approach. The technique I’m about to illustrate was born out of boredom. 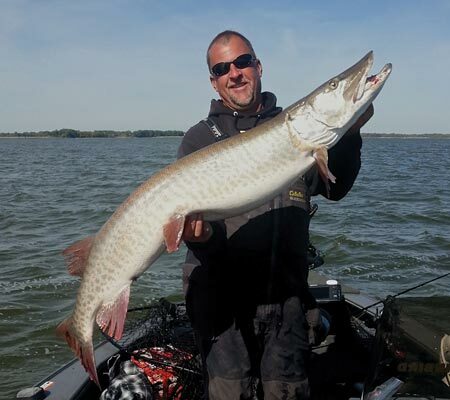 When guiding for muskies, it is critical to give your clients first shot at potential spots. While my clients cast from the bow, I stay at the stern and control the boat with the trolling motor; positioning them for what will hopefully be a chance at a fish. Now, I’m the type of guy who always has to have something to do. The “sit and relax” approach does not bode well with me, so naturally I had to find something to do while hanging out in the back of the boat. Clients would be casting traditional baits such as bucktails, jakes, ernies, and the like, so figuring it wouldn’t be the best idea to have more meat hooks flying around, I started casting smaller profile spinners, cranks, etc. ; baits more fitting for pike, bass or walleye over the spots my clients had previously fished. Guess what? I started catching fish. If you think about it, the technique makes sense. Green Bay muskies are no secret, and fishing pressure is steadily increasing every year. Fish become accustomed to seeing the same baits day after day, year after year. Smaller baits, some as small as 5 inches in length, are normally off the radar when it comes to musky fisherman, so the fish have not become acclimated to these types of lures, which is definitely an advantage. The rod and reel is probably the same setup you would use for pike fishing; a medium-heavy baitcasting combination. However, when braids and superlines are the norm these days, I opt for a 40 lb. monofilament instead. If you think about smaller baits and their construction, they most likely are fitted with lighter hooks than you would typically use for musky fishing. The mono gives you that extra stretch that is lacking in braids which is critical when trying to land a trophy-caliber fish; especially if they hit on a figure eight, or if they make a run close to the boat. When if comes to the lures, I’m not going to mention any specific names, but I will tell you that they are your typical musky profiles only much, much smaller. So WHEN should you use these smaller baits? Whenever you have pressured fish that won’t respond to traditional lures, or if you’ve raised a fish that won’t commit, it’s probably a good idea to downsize. This is a technique that shines for multiple anglers. One person throws traditional baits, and the person riding second saddle throws the downsized versions. I can’t tell you the number of times I’ve been using these downsized baits behind my clients only to their dismay when they see me hooking up in the back of the boat. Hooking and landing a monster musky on this lighter tackle is no small task. You have to fight the fish carefully in order to not straighten-out hooks or break the fish off. A long battle on light tackle, although it is a great demonstration of angling skill, also means more stress on the fish which brings me to the most important aspect of musky fishing: Proper fish handling and release. I’m probably more nervous about the release of the fish than I am about actually getting it in the boat. Trophy muskies are arguably THE most incredible fish in all of fresh water and need to be handled with respect. Always use a cradle or an oversized net with mesh that will not rip fins, remove protective slime, or harm the fish in anyway. It should be big enough for the fish to have plenty of room while inside. Always keep the fish in the water while in the net. Have pliers, hook cutters, spreaders, etc. ready at all times. When the hookup happens, the last thing you or the fish need is to be rummaging around looking for tools. Wear fish handling gloves made to protect you and the fish or, at the very least, always handle the fish with wet hands. Have camera equipment ready for your photos or videos. Keep the fish in the water until you are ready for your shots. Spend time reviving the fish properly at boat side. A played-out musky can take up to a half-hour to revive depending on the length of the battle and the water temperature. Make sure the fish is strong enough to swim off under its own power and remain upright in the water. Larry Smith is a full-time, multispecies guide in Wisconsin with 30 years of experience. He is also host of Larry Smith Outdoors television; fresh, weekly outdoor programming airing on Fox Sports North, Fox Wisconsin, CW18 Milwaukee, and Time Warner Cable Sports Channel. Check local listings for broadcast times or visit LarrySmithOutdoors.com. Like Larry Smith Outdoors on Facebook, follow us on Twitter, and please subscribe to our YouTube channel.